The clocks seem to tick a bit slower in the heart of Romania than in the rest of Western Europe. 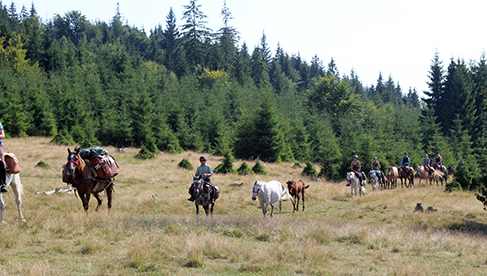 The rural region you'll ride with Hipparion in the stunning Carpathan Mountains captivates with untouched and pristine mountainous landscapes, ancient pine forests, vast fields and lush meadows, which are still today cultivated by farmers and oxen. 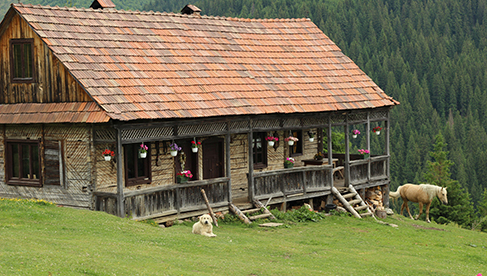 There are only small villages and the infrastructure is very limited in this part of Romania. 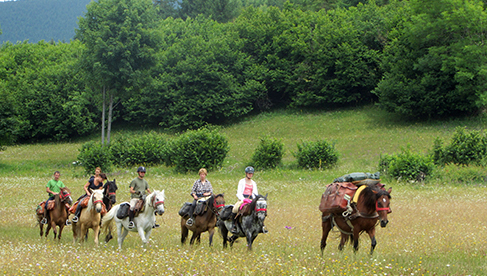 The local people prefer horses for transportation, either riding them or harnessing them to carriages. 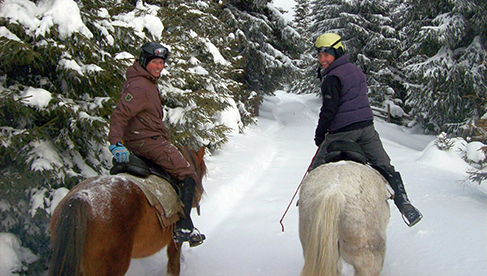 The best way to see the area is to ride like a local on horseback! 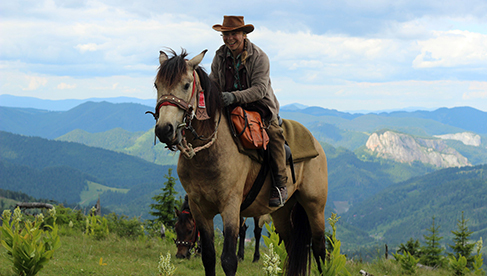 On these riding vacations, you'll meet the Székely, a Hungarian-speaking ethnic group from eastern Transylvania that live in the valleys and hills of the Eastern Carpathian Mountains. 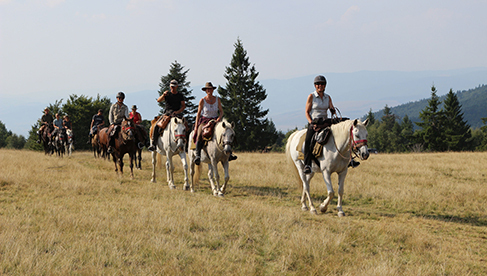 You'll ride through a mixture of high mountains, rolling hills, wild forests and wide open meadows. 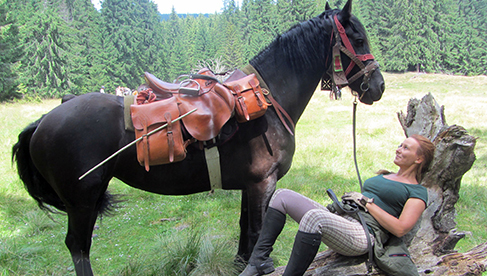 You'll ride a local breed of horses on English type trail saddles and modified army saddles. 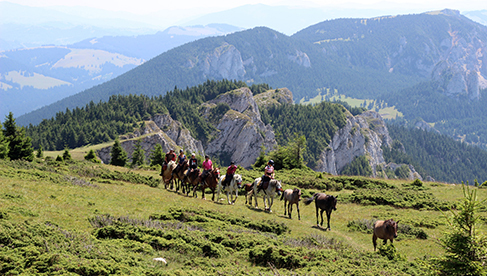 Your guide knows the trails inside and out in this regions and territories of the Carpathians and in Transylvania, meaning you're getting an insider's tour. 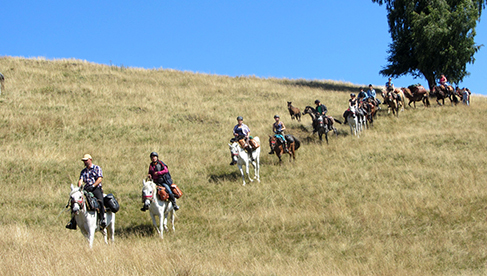 What makes Hipparion Trail Riding Tours so special is riders have the chance for free and independent rides and even gallops. Your luggage is carried by pack horses. Tents are set up on pristine, remote places amid nature. Guides speak German and English. 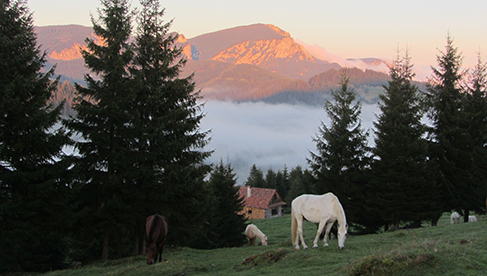 The Hipparion equestrian center was established in 1995, and is known throughout Europe. 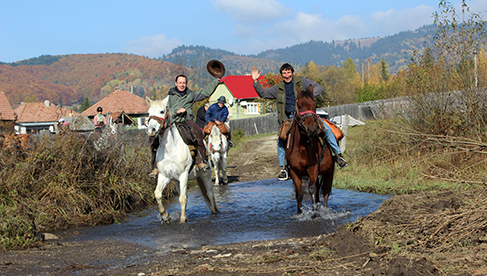 These tours are for travelers seeking an off-the-beaten-path and authentic Romania experience! 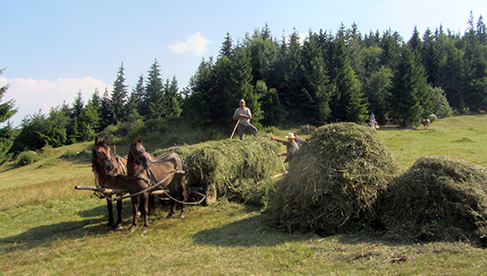 Traditional Romanian, homemade foods. 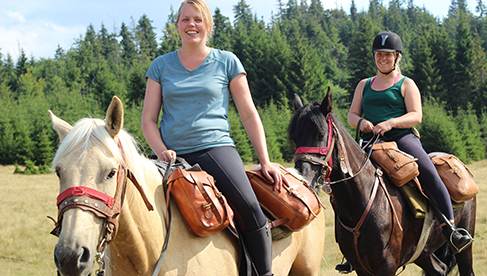 Hipparion Trail Riding Tours can offer vegetarian and gluten-free options with prior notice. 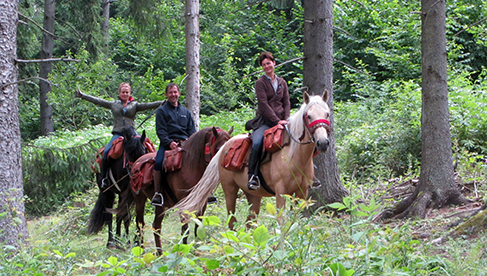 Each day, guests normally eat two warm meals at breakfast and dinner and have a picnic out on the trail for lunch. For breakfast, a buffet spread may include salami, sausage, jam, jelly, cottage cheese, eggs, mushrooms, coffee, and tea and a vegetable. Cold and hot food are served. 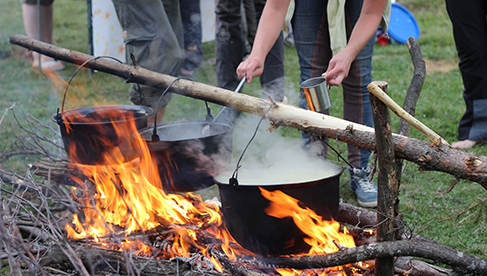 For dinner, traditional Rumanian and Hungarian meal may include soup and hot entrees. Overnights are in guesthouses, small inns and a few nights are camping in tents. Overall the accommodations are rustic in remote locales with true immersion into the local culture. Single rooms are not available. Bathroom facilities are on a shared basis. You'll be exploring the largest natural landscape in Europe. 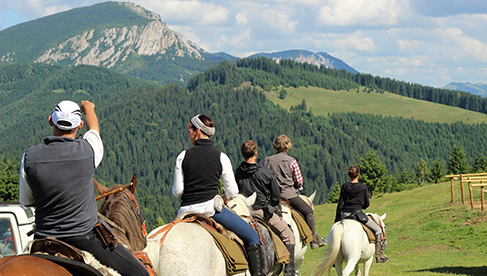 The Carpathian Mountains form a semi-circle around Transylvania, which one of Romania's nine historical provinces. 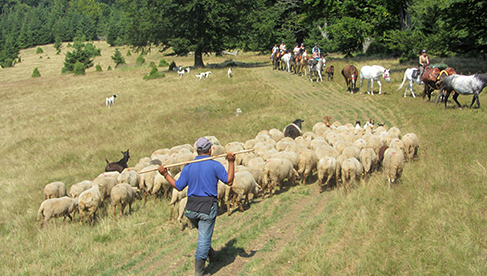 One third of Romania, which is more than three times the size of Austria, is covered in forests. 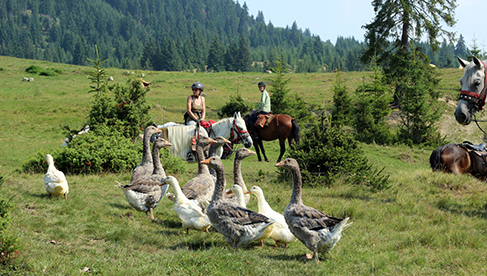 The Carpathian Mountains extend from Poland to the Czech Republic up to Romania. 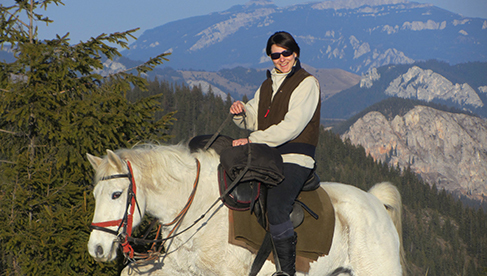 The Carpathian Mountains are a home to wonderful wildlife, including brown bears, chamois, lynxes and wolves.